Left to right: Skip Laney, Duncan Aviation Regional Manager; Justin Kragenbrink, Cimarex Mechanic; Kim Reuman, Cimarex DOM; Tim Ganse, Cimarex Chief Pilot; Kara Renner, Duncan Aviation Airframe Service Sales Assistant; Brad Lennemann, Duncan Aviation Airframe Service Sales Rep.
Kim Reuman, Director of Maintenance for Cimarex Energy, is more than a great customer of Duncan Aviation's. He's also a great friend. That's why when we saw the November issue of Pro Pilot magazine featuring Kim and others at Cimarex, we got excited. The article explores how Cimarex has come to rely upon business aviation to conduct business and expand operations. In the article, Kim describes how Duncan Aviation supports the Flight Department with larger 600 hour and 1200 hour inspections while basic aircraft maintenance and small inspections are handled in-house. They have also used Duncan Satellite and RRT shops in the Denver area for AOG support. 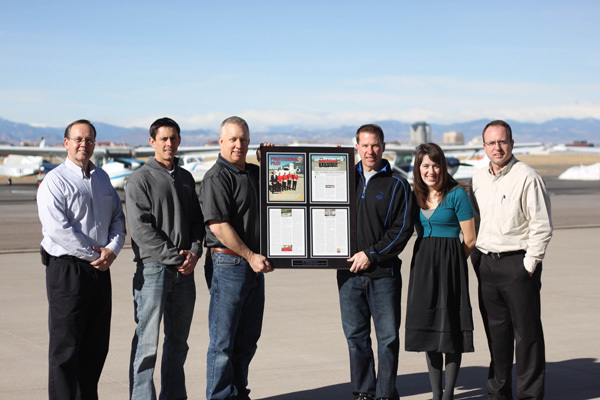 To congratulate and show our appreciation for being a great Duncan Aviation customer, we had the Pro Pilot article professionally mounted on a plaque and hand-delivered it in January. Airframe Service Sales Rep. Brad Lennemann, Regional Manager Skip Laney and I traveled to Centennial Airport (APA) in Denver, Col. and treated Kim and his team to lunch and ice cream. Cimarex Energy was very impressed and has the plaque proudly displayed in their Flight Dpt. "We (Cimarex Energy) would like to thank Duncan Aviation for the wonderful plaque they had made for us of our Pro Pilot article. This shows their commitment to Cimarex Energy. We have a great working relationship with Duncan Aviation and with your commitment, I'm sure it will continue into the future. Thank You," Kim Reuman. Congratulations Cimarex! We celebrate with you.